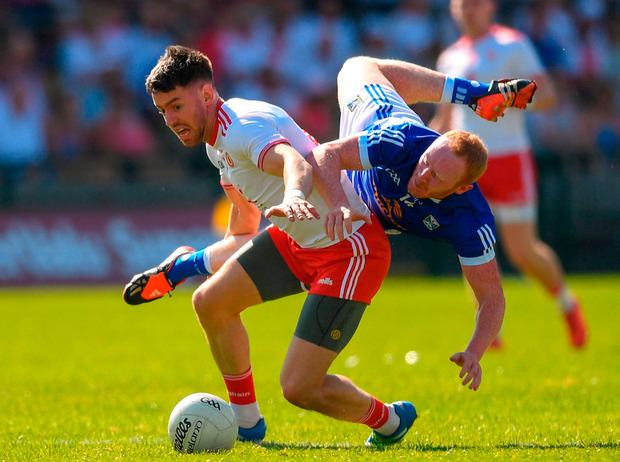 A passage of play in the first half summed up this contest well with Cavan clueless in their attempts to find holes in Tyrone's massed defence, lacking the pace and the support play and even the basic handling skills to have any impact. Except for sporadic thrusts, spurred on by an exemplary leadership display from Gearoid McKiernan, they were mostly devoid of ideas, and prone to turnovers which Tyrone should have punished more severely. But they hung in there. They were 0-5 to 0-9 behind at the break and fortunate to be that close, with Tyrone's tackling in their own half highly disciplined. It will be one of the more encouraging aspects for Mickey Harte that they conceded only one first half free. When their four-point lead went to five early in the second half it looked a question of how many they would win by. But then Cavan conjured up 1-2 out of nothing, McKiernan hitting the equalising point in the 43rd minute and, suddenly, the game was on. Tyrone switched off when Ciaran Bradley's looping kick dropped near the square and Martin Reilly stole in to finish for the game's only goal. You could tell they fancied that this might be their day. But they couldn't get in front. They never knew what it was like to lead the match. 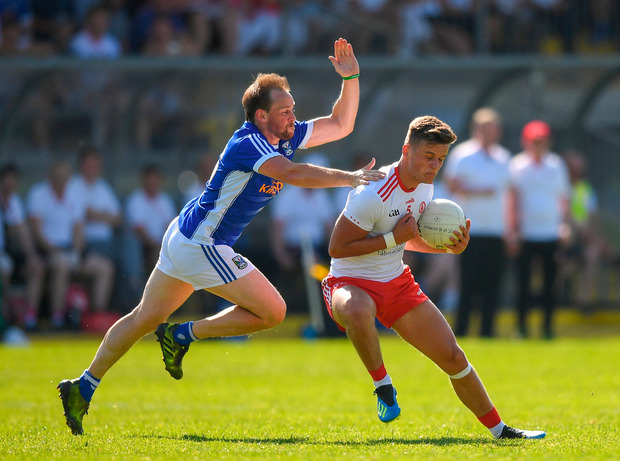 The intense heat didn't suit the high octane game that characterises Tyrone's play. 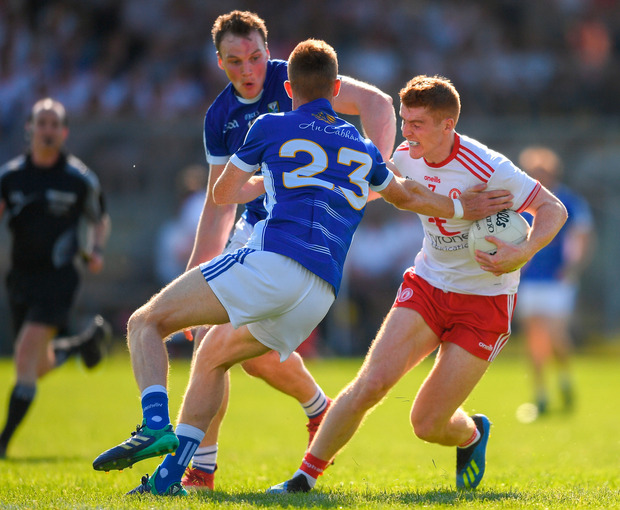 Still they weathered the Cavan storm and after Conor Moynagh levelled the teams at 1-10 to 0-13 in the 50th minute, Tyrone took things up a notch. They outscored Cavan 0-5 to 0-2 for the remainder. Mattie McGleenan failed to mastermind a victory over his native county but at least saw some fight. They fell a point behind after only 12 seconds when Mattie Donnelly scored, and were three points down early in the match before managing to get level through the outstanding McKiernan in the 13th minute. "You have to give full credit to Cavan," said Mickey Harte. "They were up for the game and with 10, 15 minutes to go it was anybody's game. The fact was they looked the team most likely to push on. You have to give them serious credit for making a fight of it. "This was a great way to go through, we are really pleased to get a game like that and go through. Whichever of the two teams to get through were going to benefit from that game. There was no walk in the park, nobody had any time off. You were on your toes all the time and it was a great battle." Connor McAliskey had his quietest game of the summer and was taken off without scoring from play. But Niall Sludden struck three points, and Tiernan McCann hit two fine points after returning from suspension. In McAliskey's absence, Ronan O'Neill stepped up and had a telling contribution for the final 20 minutes. Cavan finished with 14 men when Ciaran Brady was sent off in injury time after picking up a second yellow card. But by that stage Tyrone didn't look in any danger and with wins over Meath, Carlow and now Cavan behind them, many counties would rather avoid the Red Hands next weekend. Moynagh's point that brought Cavan level with 20 minutes left inspired a strong response from Tyrone with sub O'Neill scoring twice and Frank Burns hitting another from their best goal chance, his shot deflected over for a point by Fergal Reilly. Another score from a Peter Harte free had them four ahead with five minutes to go. Cavan had Dara McVeety and Moynagh available after their one-match suspensions were overturned on appeal. McVeety played well, more notably in the opening half, but Cavan found it hard to get through the Tyrone cover. Afterwards McGleenan hinted that he is likely to stay on for another year. He can at least console him with the prospect of Division 1 football in next year's National League. Their summer suggests they need more football in that kind of company. A commanding presence in the middle of the field when Cavan were forced to go long on their kick-outs and also strong going forward, scoring 0-5, 0-3 from play. Contributed hugely helping to keep Cavan in the match. He gets the vote marginally ahead of Tyrone's Niall Sludden. Scorers - Tyrone: R O'Neill (1f), N Sludden 0-3 each, T McCann, C McShane, M Donnelly, F Burns, P Harte (2fs) 0-2 each, C McAliskey (f), R Donnelly 0-1. Cavan: G McKernan 0-5 (0-2 fs), M Reilly 1-0; D McVeety 0-2; C Brady, K Clarke, O Kiernan, S Johnston, C Moynagh 0-1. Tyrone - M O'Neill; P Hampsey, R McNamee, F Reilly; M McKernan; T McCann F Burns, P Harte; C Cavanagh, D McClure; M Donnelly, N Sludden, C Meyler; C McShane, R Donnelly, C McAliskey. Subs: R O'Neill for McAliskey (41 mins); K McGeary for McShane (52); H Loughran for McClure (62); C McCarron for McKernan (65); C McCann for Meyler (69); R Brenna for Sludden (72). Cavan - J Farrelly; E Flanagan, K Brady, C Moynagh, E Flanagan; C Brady, M Reilly, C Moynagh; K Clarke, G McKernan; O Kiernan, C Mackey, S Johnston; N Murray, C Bradley, D McVeety. Subs: S McCormack for Clarke (inj 36 mins); A Cole for Mackey (half time); P Faulkner & J McLoughlin for Flanagan & Murray (41); C Mackey for K Brady (61); C O'Reilly for Johnston (61).